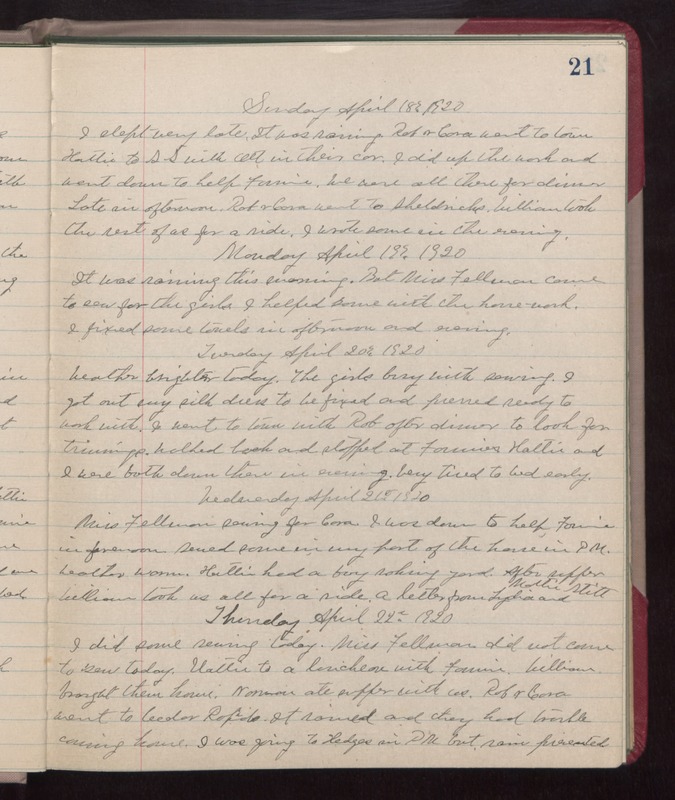 Sunday April 18th 1902 I slept very late. It was raining. Rob & Cora went to town. Hattie to S S with Ott in their car. I did up the work and went down to help Fannie. We were all there for dinner. Late in afternoon Rob & Cora went to Sheldricks. William took the rest of us for a ride. I wrote some in the evening. Monday April 19th 1920 It was raining this morning. But Miss Fellman came to sew for the girls. I helped some with the house-work. I fixed some towels in afternoon and evening. Tuesday April 20th 1920 Weather brighter today. The girls busy with sewing. I got out my silk dress to be fixed and pressed ready to work with. I went to town with Rob after dinner to look for trimmings. Walked back and stopped at Fannies. Hattie and I were both down there in evening. Very tired to bed early. Wednesday April 21st 1920 Miss Fellman sewing for Cora. I was down to help Fannie in forenoon. Sewed some in my part of the house in PM. Weather warm. Hattie had a boy raking yard. After supper William took us all for a ride. A letter from Lydia and Mollie Stitt. Thursday April 22nd 1920 I did some sewing today. Miss Fellman did not come to sew today. Hattie to a luncheon with Fannie. William brought them home. Norman ate supper with us. Rob & Cora went to Cedar Rapids. It rained and they had trouble coming home. I was going to Hedges in PM but rain prevented.